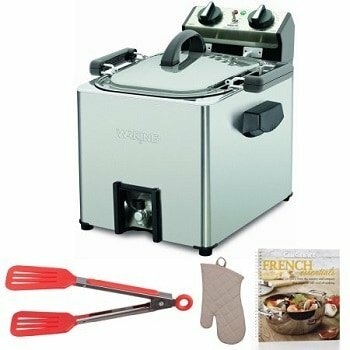 Deep frying a turkey indoors using a state-of-art rotisserie turkey fryer is made possible with the Waring Pro TF200B rotisserie turkey fryer and steamer for indoor use. Compared to the Butterball indoor electric turkey fryer, the Waring Pro has a rotisserie feature. The rotisserie rotates the bird while deep frying and thus enables you to fry your turkey in 1/3 less oil than the traditional deep fryer. The Waring turkey cooker only needs about 2.5 gallons of oil compared to the 3 gallons for a 30qt pot fried using the traditional way. Only about 2/3 of the bird is immersed in the oil using the Waring indoor digital turkey fryer. Because of the rotisserie feature with its constant rotation, every part of the bird gets to dip into the hot oil resulting in a moist tender turkey with crispy skin. This professional turkey fryer with rotisserie feature ensures even cooking as the turkey rotates during the cooking process. The rotisserie alternates direction for more even cooking. This all-in-one turkey cooker includes a large-capacity rotisserie fryer, oversized aluminum frying basket that also doubles up as a steaming basket with a patent pending lowering rack. This turkey fryer can cook a bird up to a maximum weight of 18 pounds. It cooks at approximately 3.5 minutes per pound. The 18 pound bird cooks in about 63 minutes. It comes with a 2.5 gallon stainless steel reservoir that is heated by a 1800 watt heating element. There are turkey recipes provided in the instruction booklet that is included with this package. 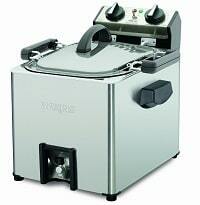 This Waring Pro turkey fryer with manual knobs can also be used as a steamer or boiler. You can easily boil or steam lobsters, crabs, clams, vegetables etc. Besides the rotisserie frying, you can do normal deep frying of your favorite fried food such as chicken wings, potato wedges etc. The aluminum frying basket can hold up to 6 pounds of food. Frying sweet potatoes (before frying, boil the sweet potatoes in water for about 10 minutes) will take about 15 minutes. Frying shrimps will take about 3 – 4 minutes, onion rings will only take about 2 -3 minutes to turn golden brown. When frying food coated with fresh batter, the trick is to lower the empty frying basket into the hot oil first. Then you can slowly put in the battered food into the oil using tongs. The basket can then be lifted to take out the cooked food. Cutting the food into uniform pieces help in even cooking. Frying a half basket of food at any one time helps in maintaining the oil temperature for better results. When too much food is added to the oil, the temperature goes down and the resulting fried food might be soggy with oil. Fill the reservoir with 2.5 gallons of water if used for boiling. Set the temperature knob to the maximum temperature and when the water boils, lower the temperature to 235 degrees F.
Fill the frying basket with the food to be boiled (max 6 lbs) and lowered it slowly into the boiling water. Food has to be completely submerged in the boiling water. Maintain temperature at 235 degrees F throughout and always make sure the heating element is completely covered by the water at all times. You’ll need to add about 10 – 12 cups of water to the reservoir. When water is boiling, lower the basket of food until the handles of the basket rest on the lowest basket support on the sides of the reservoir. The food is not submerged in the water. It is cooked by the hot steam. Covering the reservoir with an aluminum foil before closing with the lid helps in preventing steam from escaping through the vented lid. Rotating rotisserie feature ensures even cooking in less oil compared to traditional deep fryers. Stainless steel reservoir containing 2.5 gallons of oil. 120 minute timer that beeps when food is ready. Aluminum frying basket is included. Meat thermometer is included. Check whether meat is fully cooked by poking thermometer into the thickest part of the breast meat. Make sure the reading is 165 – 170 degrees F for turkey or chicken. Power ‘on’ and oil ‘ready’ green color indicator lights as well as audible timer alert help in ensuring safety and ease of use. There is an automatic shut-off feature when the hot oil reaches above 450 degrees F. This prevents over boiling of hot oil which might result in oil spilling out and resulting in a dangerous situation. You’ll have to manually reset the red button for the fryer to start operating again if the shut-off feature was activated. Stainless steel vented lid releases steam during cooking thus minimizing boilovers. Patent pending lowering rack ensures that the bird is lowered safely into the hot oil. Sturdy stainless steel construction with non slip base prevents accidental sliding and toppling over the kitchen counter top. Minimum and maximum oil level markings provided on reservoir ensures that oil is within the safety level. The amount of oil has to be between the minimum and maximum level. Patented safety magnetic breakaway cord prevents accidental toppling of fryer. When the cord is accidentally pulled, it will quickly disconnect from the appliance. The basket comes fitted with safety bars. This is to prevent the basket from toppling into the hot oil if accidentally dropped while lowering into the reservoir. This Waring turkey fryer comes fitted with an interlock safety feature which prevents the fryer from being accidentally switched on. The power can only be switched on when the heating element and control panel is in place. 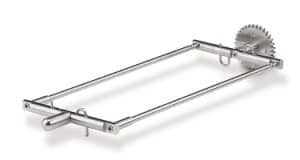 If the heating element is not properly attached, the fryer will not operate. The removable parts such as the frying basket, lid, rotisserie and reservoir have to be hand washed with warm soapy water. These parts are NOT dishwasher safe. You can wipe the control panel with a damp microfiber cloth. You can inject your turkey with marinade for a delicious crispy bird. You can deep fry, boil or steam large quantities of food possible in the large 2.5 gallon reservoir. This would be great if you are entertaining guests. Using an extension power cord is not recommended. This is to prevent getting entangled or tripping over a long cord. The lid should be kept closed during the cooking process. Try to keep a space of at least 4″ from the walls or other objects while frying. The exterior walls of the unit do get hot. Make sure the stainless steel reservoir is not heated up before pouring in the oil. Make sure the spigot for draining oil is closed before pouring in the oil. You turn it clockwise to close it. Do not mix different types of oil as the boiling or smoke point is different. An oil with a smoke point of 420 degrees F or higher is recommended. When desired temperature is reached, there will be a green blinking indicator light. It will take about 30 minutes for the 2.5 gallons of oil to reach the desired cooking temperature of 375 degrees F.
You have to truss up the turkey and attach it to the rotisserie spit for the rotation to work properly. The wings of the bird has to be tied to the body using butchers twine. Tuck the tips of the wings under the twine to ensure that they will not interrupt the rotating rotisserie action. The thighs are to be tied to the body and the feet tied to each other to ensure a smooth rotisserie frying operation. Lastly, tie the turkey tightly to the rotisserie bar. This is to prevent the bird from touching the sides of the basket or the sides of the reservoir when rotating starts as this will affect the cooking of the turkey. Add your salt and spices to season your fried bird only after you have removed from the fryer. Doing it this way will help to preserve the quality of your used oil. Hot oil will take about 2 hours to cool down. When cooking cycle is completed, the timer will ring. The fryer will only shut down after you have turned the temperature control knob to standby mode. The breakaway cord has to be unplugged from the wall outlet. Easy to use and with less mess to clean up compared to the traditional turkey fryer. You can used it indoors and not be affected by the weather. This turkey fryer with rotisserie feature is appealing. Turkey skin is crispy. Majority of customers reviews and feedback seem positive with many commenting on their juicy and delicious fried turkey. With its large capacity frying basket for deep frying, steaming or boiling, you can get more uses out of the fryer. It is certainly a great appliance to have when you have guests over for dinner. If it is within your budget, this versatile Waring Pro turkey fryer comes recommended. For those who prefer a digital control turkey fryer, Waring Pro has come out with a state-of-art turkey fryer with precise temperature control at the press of a button. 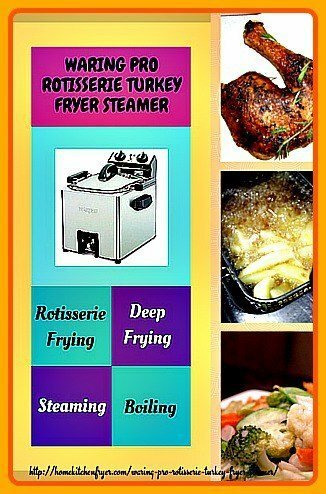 Its digital turkey fryer and steamer has a 99 minute timer and temperature control between 175 – 375 degrees F.
The rest of the features are the same as the analog control indoor turkey fryer.